!. In large bowl, combine water, whole wheat flour, potato flakes, molasses, honey, oatmeal, and salt. 3. Let stand 10 minutes then add oat bran and white flour one cup at time until dough pulls away from bowl and ball forms. 4. Knead dough until smooth and elastic. 5. Put bread in large bowl greased with 1 tablespoon canola oil, rolling to coat. 6. Let rise until double. 7. Punch down and let rise again. 8. Shape into two bread loaves and place in greased bread pans. Let rise in pans until 1 inch above sides. 9. Bake in 350 degree oven for 30 to 40 minutes. Tip: The best place to let dough rise is in an unheated oven with the lid closed. Since I've worked in a whole wheat bakery back in college, I have come to love the art and science of bread making. Sometimes it is tricky, but with practice, it becomes second hand. This recipe is a fun recipe loaded with grains. It has a lovely texture and flavor. 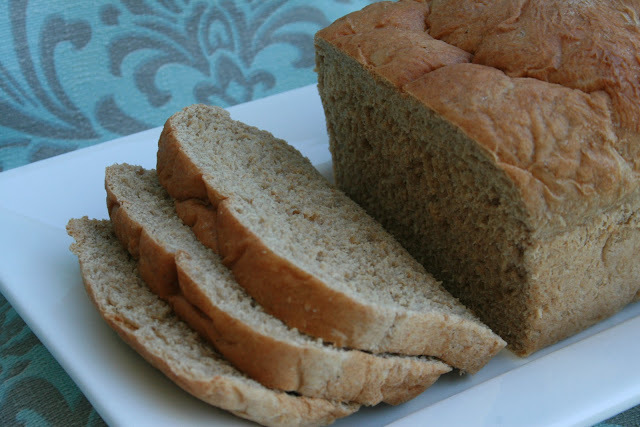 This bread tastes great plain or loaded with fixings.